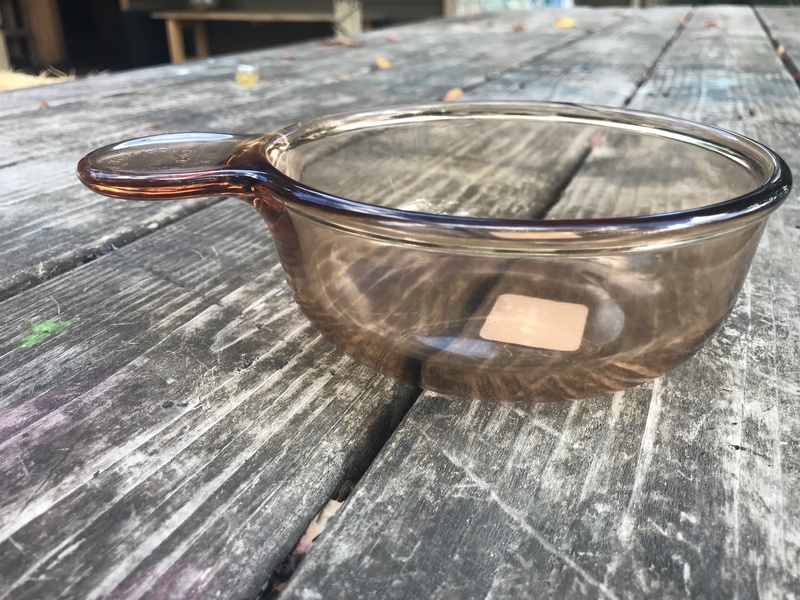 This piece is a small saucepan and differs from the piece I posted earlier in that it is “Made in France.” It also has the 3-D diamond/pyramid shaped pattern on the bottom of the pan. These ridges can be felt on the inside surface of the pan. The bottom surface of the pan is flat. This piece purchased at a Portland, Oregon Goodwill store in the summer of 2018 for $2.99. *Non-Detect = negative within the testing limitations of an XRF instrument. While this particular piece of Visionware is lead-free, some of the Visions pieces I have tested over the years have been positive for trace (very low) levels of lead. As a result, I personally do not use Corning Visionware for my family, instead I choose undecorated cast iron, clear glass and stainless steel for cooking. I can’t seem to take any photos without my kitties butting in! This is Midnight, she’s about a year old. Tamara – can you recommend brands of stainless steel and glass pots and pans to purchase?